Jon Taylor is set to leave Posh for Rotherham. Photo: Joe Dent/theposh.com. Winger Jon Taylor has completed a move from Peterborough United to Rotherham today (August 3). The 24 year-old will fulfil a desire to play in Championship football after the clubs agreed a fee late yesterday. Joe Gormley could move away from Posh on loan. Photo: Joe Dent/theposh.com. It’s considerably less than the £1 million reported elsewhere this morning. Posh director of football Barry Fry has told the Peterborough Telegraph the fee is ‘under £500,000’. Taylor’s availability for transfer was revealed in the Peterborough Telegraph last week when Fry admitted clubs were keen to take advantage of the player’s lack of first-team starts under new Posh manager Grant McCann. Fry said today: “We almost let Jon go to Bristol City earlier in the summer, but they only offered striker Wes Burns in a swap deal so we turned that down. “We always inform players of interest in them and Jon was obviously attracted by the prospect of Championship football. Jordan Nicholson is set to leave Posh on loan. “We’ve also turned bids down from MK Dons and Bolton, while Southend manager Phil Brown was on the phone every day about him. “To be fair Jon wasn’t interested in a sideways move. He had set his heart on Championship football so if he passes his medical he will be a very happy player. Taylor scored a hat-trick on his last appearance for Posh, a 5-1 drubbing of Blackpool at the ABAX on the final day of last season. He scored 16 goals in 76 appearances (60 starts) for Posh following his move from Shrewsbury in June 2014. He scored 13 goals last season and finished joint top scorer for the club in League One with 11 goals. Fry also revealed that midfielders Harry Anderson and Jordan Nicholson are on the verge of completing loan moves away from the ABAX Stadium. 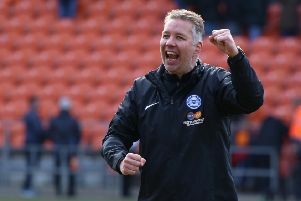 Posh are also ready to loan out striker Joe Gormley, a first-half hat-trick scorer at Histon last night, with an as yet unnamed Scottish League club showing an interest.